Welcome to the first day of spring and my day to share birdy creations. When I signed up weeks ago I thought SPRING and all the wonderful fresh beginnings it implied. In my little corner of the world - Atlantic Canada - we have been treated by nature to weeks of major blizzards and snowstorms and Nor'easters. Looked in my stash and found lots of bird prints. I took the quilt for a walk in my driveway this morning for pictures. I normally take pics on my clothesline but too much snow to reach it. These are taken in the banks beside the drive. They have reached 8 feet tall making it nearly impossible to shovel the snow. Lots of hours of shoveling to clear it this morning. But I did get the car out. A mixture of winter and summer birds means lots of color. This was a real learning process because it is my first quilt-as -you-go. The fabric featured on this hop is so pretty. Could not resist it when it appeared at the local fabric store. First time I ever tried graphing letters. Square in a square is a great way to feature pretty prints. These bright and perky birds cheered up the winter. You always need something when Xmas disappears. A special thank you to Lana and MdmSamm for the time and energy they devoted to the Tree Bird hop. It is always so enlightening to see how many creative and unique projects are stitched. If you visit today's hoppers you will be impressed. You are so talented! THESE ARE SO BEAUTIFUL! Your quilt is just so much eye candy! And your letters are PERFECT! I just loved all of your projects and that you BRAVED the Blizzard weather to take those pictures!!! But oh how they showed off that BEAUTIFUL quilt!!! YOU DID GOOD GIRL!!!! Love your beautiful quilt and the LOVE runner is sew creative! WOW that is a lot of snow. Thank you for sharing. They are all just lovely. You were a busy lady. Love the quilt. WOW, you really made quite a few tree bird projects that will rush Spring to our doors. They look nice, thanks for sharing. Your Bird Projects are so TWEET!!! Please forgive me for not posting. I tried until 2 a.m. to get my bird pics to upload to my computer but no luck. I hope everyone will understand. I like to keep my commitments. A fabulous collection of beautiful bird projects! Beautiful! You have some lovely projects there. Great job. Lovely quilt and the backdrop of snow in your drive is an awesome showcase. The rest of your projects are terrific. wonderful pieces!! we certainly have our share of snow!!!!! What beautiful projects and I can't believe the snow you still have! Keep warm! So sorry to hear about all that snow. It's time for spring to spring! It did make a pretty background for your quilt pics! What a beautiful quilt among all that snow! (I can't even imagine what it would be like to deal with piles of snow that high! Your quilt is certainly a "breath of spring" among all that cold whiteness! Your table runners are great ways to showcase this pretty fabric too! wow your projects are just wonderful. I especially love the 1st quilt. oh and the LOVE runner, LOL I love them all. OHhhh all that snow. hope it stops soon. Hi, Frances! What a lovely quilt...all that snow is really a perfect backdrop! Your bird projects are so cute. I love what you did with the lettering! The quilt turned out beautifully too. Perhaps it will add enough warmth to melt some of that snow. So many beautiful birdy projects! I adore your table runners. I really like the way the graphic squares highlight the prints in them. Beautiful line up of birdie projects. I love the way your quilt has a kind of 3D effect... just lovely! So much snow, but it really made a nice backdrop for your beautiful quilt...love it! Lots of sweet looking projects with your bird fabrics! 8 feet of snow... you need to wrap up in that beautiful quilt and stay inside! Yikes!! I love all your spring time bird projects, and I hope they bring you that spring that I know you are all desparate to see! I've been reading all winter about the amount of snow that Atlantic Canada has been getting as my husband has family in Nova Scotia. We've been complaining about the amount of snow we've had here in southwestern Ontario but it's not even half what you've had. Stay way, stay safe until spring arrives. All your projects are so pretty! The quilt is gorgeous. And the tablerunners will certainly keep things cheerful until the robins and other spring birds return. Wonderful projects. Spring is coming! So much talent and productivity. The snow makes me want to wrap up in that beautiful quilt. My broken thumb thanks you for the prayer. Wow Francis Your winter birds are a bright addition during a cold and snowy winter. I can see why you pulled them from your stash. 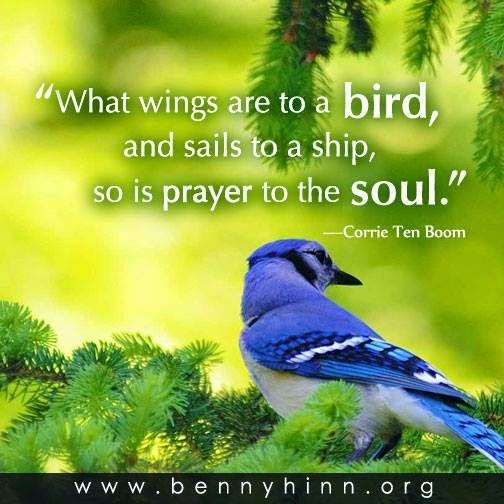 Thank you for sharing with us as well as the uplifting message too. Your projects are all lovely! I love your quilt and the "Love" table runner. Beautiful work! I am sending warm wishes your way! I love your quilt. You sure made those fabrics just pop. Beautiful! All your projects are adorable. Good choice in showing off the birds. Wow! Look at all that snow! Your bird fabrics are so lovely - they make your quilt shine! Love the way you featured fabrics on your table runners too - so clever! Wonderful workmanship ! Love each and every creation ! Did you like doing the QAYG? Love your projects, even though I'm soooo tired of snow, you quilt looked beautiful with the snowy backdrop. I Love your 'love' table runner, so very pretty. You got so much done and it's all beautiful. Thank you for sharing today. You look like you have been busy....probably snowed in from the look of those pictures! Love the table runner, such a pretty fabric. Lovely quilt with great color flow. The fabric lends to many ideas. congrats on trying new things and mastering them! I agree, we need spring, NOW! 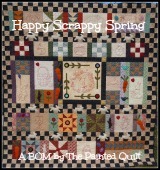 First day of spring, snow and beautiful quilt and other projects.. You can not go wrong with that! So many beautiful projects, thanks for sharing them. It is hard for us on the west coast to imagine what it is like to have so much snow. Happy Spring! Great projects, love all the different bird fabrics you used. I'm not going to complain about the 6 inches of snow we got last night!! Your quilts are lovely! I love the text on the quilt! That is a LOT of snow. Hope your lovely projects tide you over until spring arrives for you. Thank you for sharing. I am impressed by your work! The lettering is fantastic! Hope Spring comes soon for you!